When you are really stuck for an activity, window shopping can be just as interesting for kids as it is for adults. 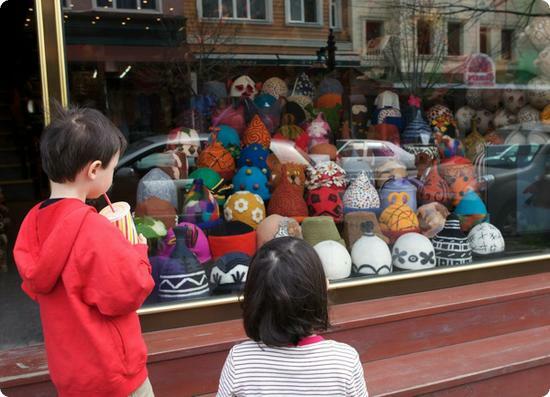 Istanbul's felt making tradition makes for some interesting window displays, including this window full of felt hats. I wonder what dress-up games the kids were imagining as they checked them out. Jen on June 3, 2010 at 6:07 p.m. I am really enjoying your pictures and stories so far from your trip. I don't know how you got your kids away from the hats...I don't know if I could have gotten them to leave without trying some hats on!! Mara Gorman on June 3, 2010 at 7:32 p.m. I agree with Jen - and I have a feeling a couple would have come home with us! Margo on June 3, 2010 at 9:29 p.m.
Sonia on June 3, 2010 at 9:40 p.m.
Debbie on June 3, 2010 at 11:16 p.m.
Kerry on June 4, 2010 at 3:31 a.m.
great shot -- and great reminder, too, about window shopping with kids. always something to see and talk about. Lucia on June 4, 2010 at 6:15 a.m. I am a sucker for felted things...good thing we didn't see that store window during our trip. Pet Friendly Hotel on June 4, 2010 at 9:33 a.m.
Heather on her travels on June 4, 2010 at 1 p.m.
karing for kids on June 6, 2010 at 10:39 p.m.
Flights to Johannesburg on June 7, 2010 at 4:09 a.m.
Beautiful hats,i wish i could try those hats on.